So I'm awfully late getting around to this one. But I could just never find a copy and then with all the cover issues it was in and out of stock everywhere for what seemed like ages. It sounded like a book I wanted to read right off the bat, despite the issues with cover and availability. Finally my family took pity on me and gave it to me for my birthday awhile back. And now that it's been nominated for the Cybils, I decided it was high time to find out what all the fuss was about. Magic Under Glass is Jaclyn Dolamore's debut novel and it resides somewhere in the realm of fantasy meets steampunk meets historical fiction. For the record--a realm I love very, very much. I've read quite a mixed batch of reviews on it around the blogosphere, but I was nevertheless fairly excited still to find out for myself what lay between the pages of this slim but intriguing book. Nimira is one of the so-called trouser girl. Young women who sing and dance in rather seedy dance halls across Lorinar for two cents an admission. Fleeing her lush homeland of Tiansher after her family's ruin, Nim seeks out the fabled dance halls of foreign Lorinar, where the magic and success she imagines falls so very short of her dreams. Trouser girls are out of favor and looked down upon. And it is not until three years later that Nim spies her ticket out when a young gentleman by the name of Hollin Parry walks into the hall and makes her an offer she can't refuse. Come sing along with his piano-playing automaton and live a life of ease. Never mind that the automaton might be haunted, or that there's quite a bit Hollin's not telling her, about both his history and his estate. Nim jumps at the chance, determined not to be put off by a clockwork man like so many other girls Hollin hired were. After all, he's just a contraption of wood and gears made to look like a man. Stick the silver key in his back, wind him up, and sing along. What could be simpler than that? 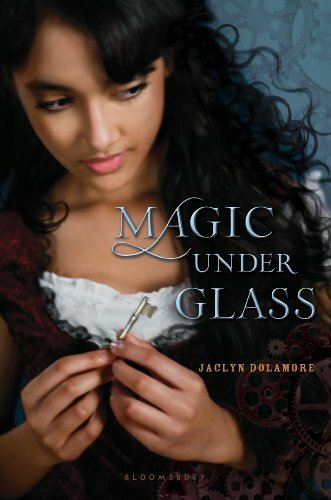 Magic Under Glass is an easy, read-in-one-sitting sort of book. I enjoyed the world Ms. Dolamore created, with its impending war between faeries and humans and I loved the descriptions of Erris the automaton and his shifting eyes, his skillful fingers, and his inability to move beyond a careful set of scripted motions. There was frankly a wild amount of potential in this storyline. And I do mean wild potential. I loved the stolen practice sessions in which Nim sat next to Erris and decoded his stilted messages and longed for the ability to converse normally and at length. I loved the idea of the faerie court in uproar and the mysterious hints at necromancy. But unfortunately, none of it came to fruition for me. What a disappointment it was, as the characters stayed firmly two-dimensional, the villain painfully uninteresting, and the relationship between Nim and Erris set up so wonderfully but remaining completely undeveloped. I finished the book merely out of a sense of obligation and one last lingering hope that it might pull out in the end. But all I got was slapdash characterization and a bewilderingly hurried resolution, if you can call it that. The whole thing felt like a synopsis, if you will, and not the final work. I realize there is a sequel in the works, but this novel needed so much more depth and breadth to it to keep me going. Too bad this didn't work out for you. I'm glad you reviewed it because the premise looks promising but I probably won't pick it up anymore based on your feedback. Since it had great potential, and some small parts you did enjoy, do you think you'll give the sequel a try? Michelle, I don't think so. Everything felt so flimsy to me I don't think I'm up for the sequel.